Ghana are now through to the semi final of the African Nations Cup. 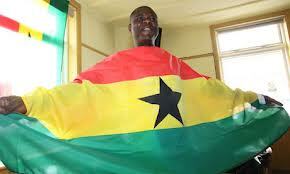 If you like your football, no-one celebrates football as they do when Ghana play in competitions. The World Cup was a fantastic atmosphere – Oh how all the neighbourhood groaned when Ghana got knocked out on penalties. So on Wednesday Night come and soak up the atmosphere as Ghana attempt to get into the Sunday’s final. Kick off is 6:30pm but no doubt the pub will be packed before then.